Parse that comment carefully. He's not saying that he provided a thorough and fair accounting of the steroids era. He's saying he provided a thorough and fair accounting of what he and his staff learned about that era. Those are two very different things. As I write in my article about the Mitchell Report in the 2009 Hardball Times Baseball Annual, the famous report didn't learn all that much. It certainly didn't come close to providing anything approaching a comprehensive look at how steroids came to baseball, what they meant to baseball, and what, exactly, baseball was to do with all of this new information after December 13, 2007. All of which, I humbly offer, would be useful stuff to know. The Mitchell Report was never intended to do that, however. Its primary purpose was to serve as the very public signpost marking the end of The Steroids Era. To give the teeming masses what they wanted – blood in the form of many named-names – while assiduously ensuring that not too many rocks were turned over and not too many apple carts were upset. To highlight baseball’s dirty past in just such a way that allowed people to believe that it was all in the past so that baseball could rid itself of its P.R. problem and look forward to its glorious future. If Mitchell wants to call the Report a success he can. He should just be accurate about the very specific way in which it was successful. 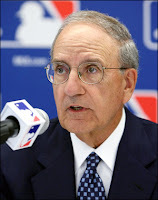 You have to admit, The Selig and Mitchell both, once The Selig got his bearings straight and set his attention on righting the PR ship, have performed the task just about perfectly. It's not Peace Accord in Northern Ireland good but I think referencing it as a positive on the old resume would not be lying. You're preachin to the choir Craig. Yes, it worked perfectly as far as placating the fans ( although I've always argued that most who attend games don't know Radomski from Conte ). Jeff Blair has described it as the industry's " mea culpa ". Beyond that....yes I think there is less juice in the game, but 3 positive tests amongst the big leaguers this season ( none anybody would recognize except us geeks ) is absurd. It's become like the NFL, there is policy and testing and the occassional suspension...but any real stringent efforts to de juice the game, naaaahhhhh, ain't happenin....you can't turn back the clock, bigger, faster, stronger sells not smaller, slower, weaker. Amazing that Tom Verducci's steroid manifesto came out in June 2002, and that wasn't compelling enough to get Selig & Co. off the couch. It's worth another read: "http://vault.sportsillustrated.cnn.com/vault/article/magazine/MAG1025902/index.htm?eref=sisf"
This was my laugh-out-loud moment of the day. I have never seen a public figure orally recite — if not exaggerate — his resume over the course of a career without the requisite run for president. It's a miracle he's boasted so little about his single-handedly eradicating steroids, amphetamines and excessively pine-tarred helmets from the sport of baseball.